Some more photos of the Park Street Bridge. There is a nice web posting written by the County of Alameda on this and the other crossings to Alameda Island. 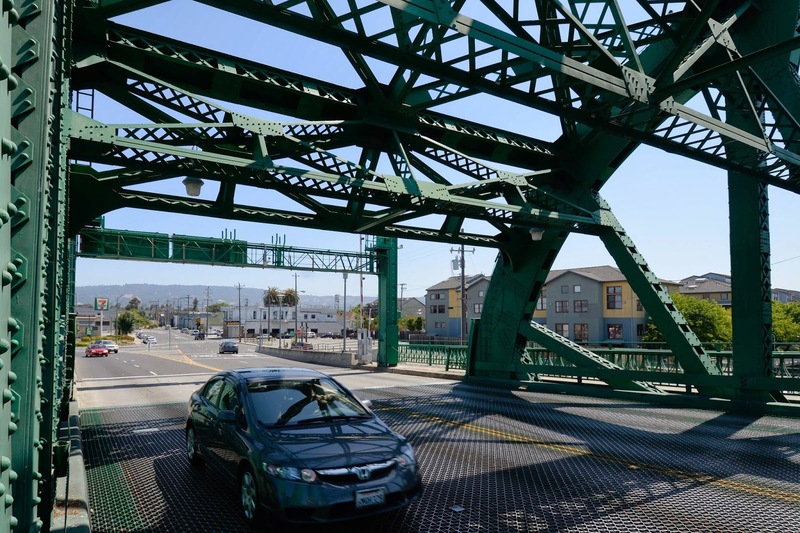 The first bridges were built in 1893 by the U.S. government in exchange for permission to dredge the Oakland Estuary between San Antonio Creek (the outlet for Lake Merritt) and San Leandro Bay. The current Park Street Bridge was designed by the Alameda County Surveyors Office and build with funding from the WPA Program during the Great Depression. During the opening ceremony a man from Oakland married a woman from Alameda to symbolize the bridge between the two cities. Movable bridges have to be very light and very rigid to handle constantly being raised and lowered. A lightweight open steel deck, lots of cross-bracing, and laced members with steel rivets holds the bridge together. This bridge is raised and lowered about 1800 times a year and carries over 40,000 vehicles every day. There is an operator's house on each end of the bridge and the bridge can be opened at each end. Each leaf is opened and closed with a 75 horsepower main motor and a 5 hp backup motor. There are also two service brakes and two hydraulic brakes (for emergency stopping of the leafs) The leafs can rotate up to 78 degrees, which is considered fully open. An alternating four person crew operates the bridge. The electrical system was renovated in the 1960's and there was a $5.6 million renovation in 1998 during which the bridge was closed. Alameda County, California Bridges: Park Street Bridge across the Oakland Estuary (3) by Mark Yashinsky is licensed under a Creative Commons Attribution-NonCommercial-NoDerivatives 4.0 International License.